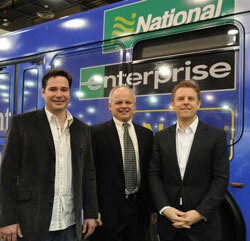 Enterprise Holdings made a major announcement this morning at the Conference. Enterprise Holdings today announced plans for its entire fleet of more than 600 Alamo Rent A Car, Enterprise Rent-A-Car and National Car Rental airport shuttle buses across more than 50 North American markets to begin using at least 5 percent biodiesel (B5). Pictured at the press conference are (l-r) Joe Jobe, CEO NBB, Dr. Richard Sayre, Director, Enterprise Rent-A-Car Institute for Renewable Fuels, and Lee Broughton, director of corporate identity and sustainability for Enterprise Holdings. Each of them spoke at a morning press conference. Further, the company will immediately convert buses in nine markets to 20 percent biodiesel (B20) as a first step toward the company’s goal of converting its entire bus fleet to B20 over the next five years. Enterprise Holdings expects to complete the conversion to all B5 by spring of this year, with at least 50 percent converted to B20 by the end of next year. Buses in nine markets are immediately being converted to run on B20 where the fuel is centrally stored and available: Boston, Chicago, Denver, Detroit, Los Angeles, Miami, Raleigh/Durham, San Antonio and San Diego. In addition to embracing biodiesel and other alternative fuels as they become commercially viable, Enterprise Holdings also provides strong support for renewable fuels research. In 2007, the company’s owners, the Taylor family, made a $25 million grant to the Donald Danforth Plant Science Center in St. Louis to create the Enterprise Rent-A-Car Institute for Renewable Fuels. Led by renowned plant researcher Dr. Richard Sayre, top scientists work at the Institute to develop alternatives to finite fossil fuels by finding new ways to create fuel from renewable, reliable plant sources.